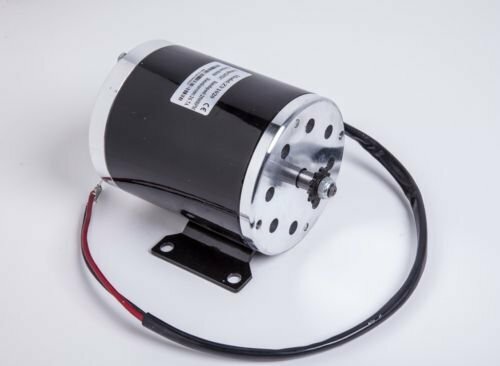 Specs: - 24V DC - Max 500 Watt, 26.7 amps - Max 2500 RPM - Chain drive (11 teeth sprocket) #25 chain 6.35 pitch - Type of motor: DC, Brush - Reversible - 12 gauge leads - Permanent Magnet Dimensions: - Diameter: 4 1/4" - Length (no shaft): 5 1/4" - Length (with shaft): 6 1/4" This motor should work with some Xtreme or Razor electric scooter, mini bike or go-kart using a 500W motor. Should also work with any other brand with similar specs in motor Please check connector type and motor size and specs. before buying as replacement. - Diameter: 4 1/4" - Length (no shaft): 5 1/4" - Length (with shaft): 6 1/4"